Ten years ago, Wizards of the Coast introduced a new world to players of Magic, and a new story began. Set on a remote continent of the world, Otaria, 2001’s Odyssey brought a new cast of characters, new themes, and- of course- new mechanics. Although there wasn’t a great deal of flavourful resonance typing the mechanic to the set, the graveyard became the focus of the new bag of tricks. First up was a mechanic that rewarded you for having a well-stocked graveyard, with spells and creatures that became more powerful when a threshold of seven cards were there. And while the set included a number of ways to stock it, flashback ensured that played or discarded cards could have a second lease on life. These were fine enough ideas, but there was some feeling within Wizards that the set really didn’t quite do them justice. Without any thematic tie to the graveyard they were more or less just naked mechanics, and it had the feeling of an opportunity missed. What a graveyard-based set really needed was something that would weave in the tropes and themes associated with actual graveyards. What it needed was a little dose of horror. 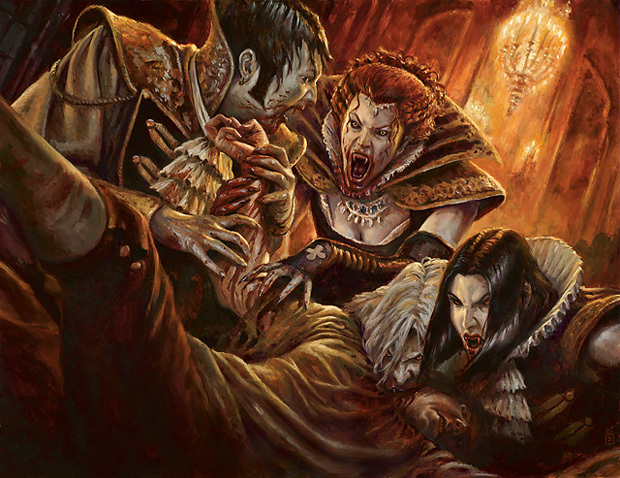 As Mark Rosewater writes in one of his excellent articles about the origin of Innistrad, the gothic horror set he’d been keen in designing for some time but never could quite manage enough support for found its sails filled with wind as American popular culture returned to the dark embrace the vampire. 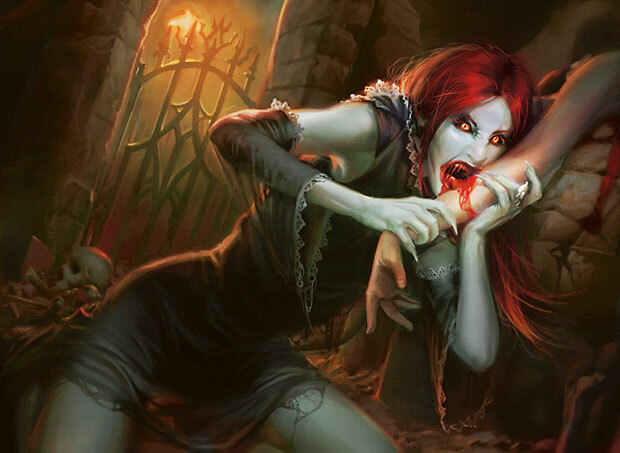 The evolution of the Vampire tribe in Magic has had its twists and turns (as we discussed some time ago here), but one could hardly find a more suitable set and setting for them than this one. 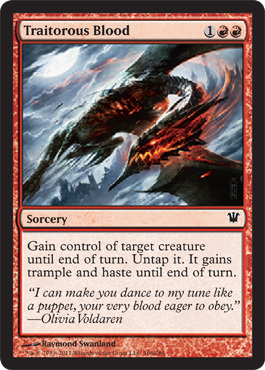 On that note, we begin our review of this most dark of sets with Carnival of Blood, the Black/Red tribal deck. Vampires in modern Magic have managed to carve out a very distinct identity for themselves, buoyed by a succession of mechanics that seek to encapsulate the essence of what it means to be a predator driven to consume the ‘wine of the vein.’ In Zendikar bloc, this was often mechanically represented in a number of ways which cared about the life of your opponent. Lifedraining: Cards like Blood Seeker, Kalastria Highborn, Pulse Tracker, and Bloodrite Invoker all attacked the life total of your opponent directly. Blood frenzy: Other Vampires would become more powerful, overcome with bloodlust when your opponent was at 10 life or less. Examples of this model include the Guul Draz Vampire, Vampire Lacerator, Bloodghast, and Ruthless Cullblade. Murderous: Still others went after your opponent’s creatures rather than your opponent directly, draining them of their vital essence. Here we find the Gatekeeper of Malakir, Guul Draz Assassin, and Anowon, the Ruin Sage. Of course, you had a raft of other on-theme abilities like deathtouch and lifelink sprinkled throughout (and, in the case of the superb Vampire Nighthawk, one had both), but all in all the Vampires of Zendikar both mechanically and flavourfully were given a very distinguishing treatment. 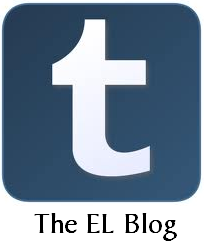 Hopefully they made the most of it, because the tribe would soon find itself on mothballs. Last year’s Scars of Mirrodin contained a whopping three Vampires, not counting cards with Vampiric flavour like Go for the Throat. Perhaps it counts for something that this was a twofold increase over the number of Vampires in the original Mirrodin block, whose contribution to the cause was the very lonely Mephidross Vampire. The Bleak Coven Vampires had diddly to do with artifacts but still had metalcraft stuck on there for an added lifedrain effect. Fortunately, that Melvin-style tack-on was made up for with much more interesting cards like the Sangromancer and Chancellor of the Dross. And the Vampires were hardly out of the game. Magic 2011 had a small complement of them- only five- but the selection did include a rare tribal lord (Captivating Vampire). They had the usual minor vampiric themes (lifelink, sacrificing your own creatures for effect, etc), but the tribe as a whole was kept alive by the development of an Intro Pack focusing on them: Reign of Vampirism. 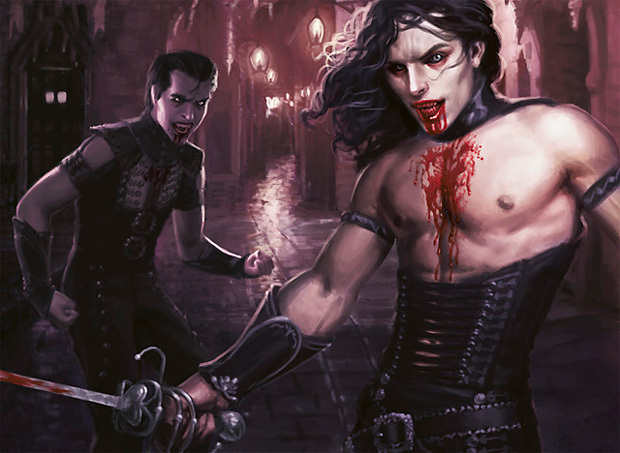 Magic 2012 gave us a mythic Vampire (the first for the Core Set since Magic 2010’s Vampire Nocturnus), Bloodlord of Vaasgoth, and the Vampires found that they were well-positioned with the return of the bloodthirst mechanic. The Intro Pack deck Blood and Fire played on these themes as well. With Innistrad, they’re poised for another renaissance, and this time their predatory urges have found expression not only in Black, but in Red as well. They also are focused around the design commonly known as the “Slith” mechanic after a series of creatures from Mirrodin Block (such as the Slith Firewalker) which had this ability. These Vampires might start small, but they get +1/+1 counters every time they damage an opponent. In other words, they grow stronger with every passing taste of blood. The fittingly-named Carnival of Blood showcases this concept most… lustily? What’s interesting here is that the deck bumps back up at the top of the curve, giving you a few closers to finish off your opponent with. As we’ll see, there are more than a few tricks along the way to get you there. In the two-drop slot, we have a number of eager bloodsuckers ready to take the fight to the foe in the early game. The aofrementioned Blood Seeker- reprinted in M12- makes an appearance here in a matched set. There’s also a singleton Child of Night. The remainders, though, are all from Innistrad. 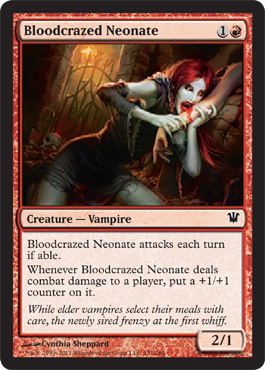 The trio of Bloodcrazed Neonates are fragile- they obligate an attack each turn, and their 1-toughness means they’ll fall to very nearly anything. But if they manage to get through, they’ll begin growing immediately. Cards like this can really punish an opponent with either a slow deck, or just one that happens to be developing slowly, and make for a solid early play. Finally, a pair of Vampire Interlopers give you some evasion in the air, although they have the drawback of being unable to block. In fairness, if all goes to plan that’s hardly a drawback at all. Next up we have the three-drops, and leading the pack is the controversial Rakish Heir (controversial in the sense that some found cause for objection to the art). 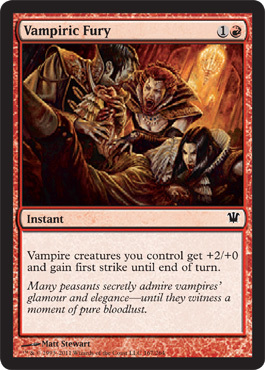 We can all but guarantee that the most objectionable thing about the card to your opponent will be the pressure it puts them under- like all ‘Slith’-style Vampires, they’re not a problem easily ignored. The Heirs have the added bonus of not only affecting themselves, but any Vampire you control. A pair of Markov Patricians are amped-up Children of Night, with a more lopsided power/toughness. It’s an irony of card design that the more overtly aggressive you make a card (by skewing in favour of power), the more tempted many will be to use it defensively. A 3-power defender often seems the better use of such a creature than a 1-toughness attacker. However, you are not without ways to make sure that they can either get through unmolested, or trade with something worth trading for. 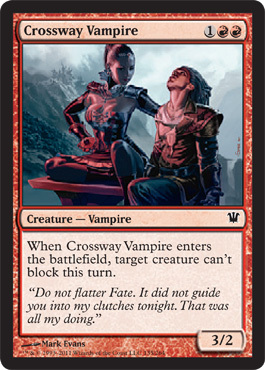 Indeed, the pair of Crossway Vampires are almost custom-built for this purpose, faltering an opponent’s would-be blocker. Later in the game, when they have a mana dork sitting about collecting a paycheck, you might well use the Crossway to keep it off the list of eligible blockers when you send in the Patrician. 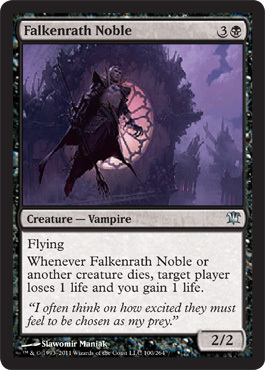 There’s a dramatic drop-off at the four-drop slot, which consists solely of a pair of Falkenrath Nobles. A touch pricey for a 2/2 flyer, they also have a very strong life-syphoning ability that is triggered whenever any creature dies- nout just your own. However limited the options here, you are given plenty more for five-drops. 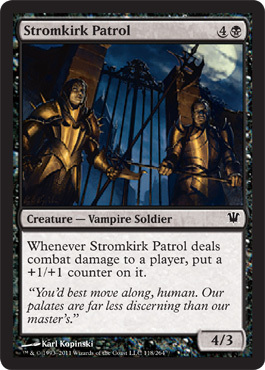 A pair of Stromkirk Patrols continue the +1/+1 counter-gaining theme present throughout the deck. 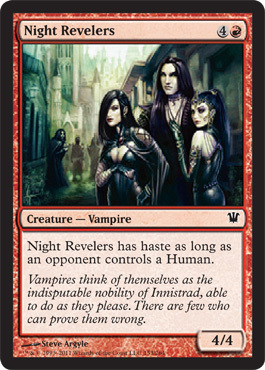 A solid 4/3 (in an environment where 3 toughnessis less of a liability with the rotation of Lightning Bolt), they are superseded by only two others: the Night Revelers, and the classic Sengir Vampire (returning to M12 and last seen in Tenth Edition). The Revelers are a 4/4 body that enters the battlefield with haste if your opponent controls a Human- hardly a difficult condition. The Sengir Vampire gains its counters the hard way, only growing when it manages to kill off a creature. 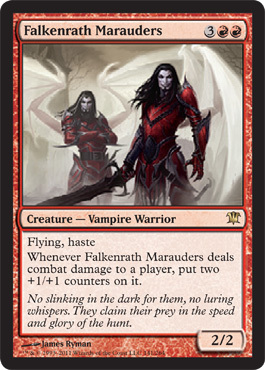 Finally there is deck’s foil premium rare, the Falkenrath Marauders. As a 2/2 flier with haste they don’t seem like much, but they gain two +1/+1 counters with every successful strike against your opponent. 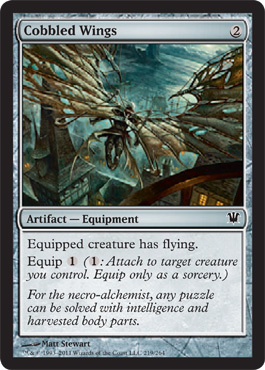 Unless they’re playing a skies deck with lots of aerial defenses, the Marauders are a must-answer card. Supporting your tribe of Vampires is a number of spells and artifacts. First, the bad news: your removal is dreadful here. You have all of two kill spells, both of them Tributes to Hunger and both of then untargeted. The Tributes are, in essence, faster Consuming Vapors without rebound, for one less mana. It will often take some maneuvering to be able to use it to kill the creature you need it to. For burn, you have recourse to a single Fireball. Fireballs are always strong in this format, as they can remove one or more threats or finish off a wounded opponent. But that’s all you get. The next-closest thing you have access to are a pair of Vampiric Furies. A variant of Thunder Strike, Vampiric Fury restricts itself only to affecting your Vampire creatures, but in doing so affects not one, but all of them. It can be a potent finisher for extra damage, or lead to blowout attacks (or defenses, if it comes to that). It’s cheap cost ensures it will have a solid place in your hand. Next we have a number of cards that augment your Vampiric army. Cobbled Wings bestow flying, which can be a huge help in ensuring your hungry and growing forces are able to feast upon your foe. 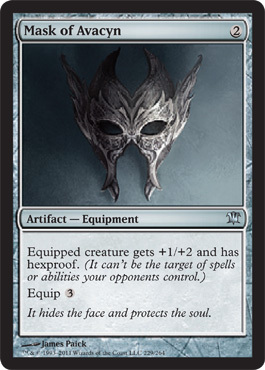 A pair of Masks of Avacyn provide a power and toughness boost, and add hexproof to boot- perfect for protecting some of your stronger options. A Gruesome Deformity gives its target intimidate, another solid way of slipping it through the red zone (assuming you’re not playing against Black, Artifact, and/or Red creatures). Finally, the deck’s other rare, Curse of Stalked Prey, layers on another ‘Slith’ effect for all your creatures. This has the potential for sheer brutality- if your Falkenrath Marauders get through on your opponent while you have this and a Rakish Heir out, they go from 2/2 to 6/6 after one attack! Lastly, we have a few odds-n-ends crammed into the deck. 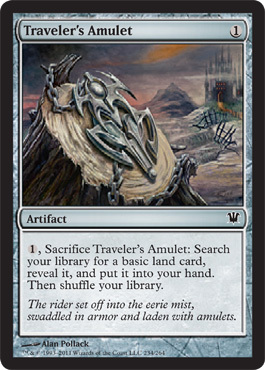 A Traveler’s Amulet is a bit of mana-fixing, not entirely necessary in a deck with few colour-heavy cards. 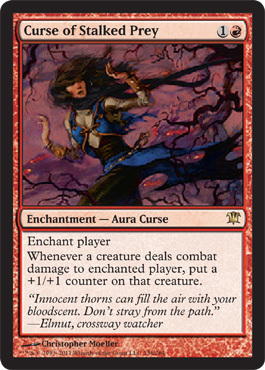 Traitorous Blood is the latest version of the Act of Treason class of spells, adding in trample to the stolen creature. Alas, given the lack of sacrifice outlets in this latest Vampiric offering, you can’t take full advantage as you once might have with Vampire Aristocrat and his ilk. Tectonic Rift is a dual-purpose spell, which can blow up a land as well as falter your opponent’s defense, rendering them unable to block for a turn. In conjunction with Vampiric Fury, you can set up a vicious alpha strike. 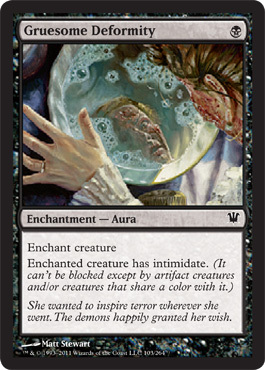 You also have a Night Terrors (targeted handkill), as well as a Diabolic Tutor as a four-mana joker in the deck. Join us next time when we take to the streets with our Vampire horde, and see how they perform when put to the test! Well, this is earlier than expected. 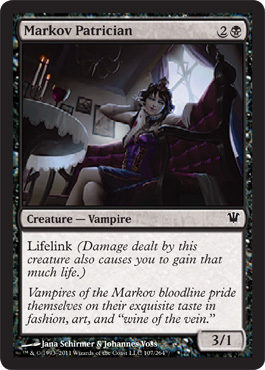 The deck looks pretty cool; certainly more interesting than previous vampire precons with the addition of red. However, I think the criminal (seriously, what better way to get your vampires through than by killing blockers?) shortage of removal could be an issue. 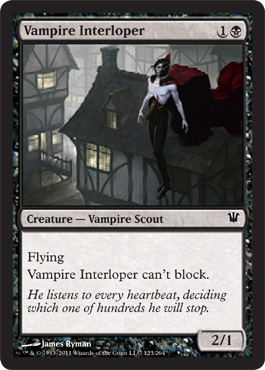 Tempting to make my mono-black casual vampire deck into a BR casual vampire deck. Though i don’t see too many vampires that would fit the theme it has going. Anyway, nice write up as usual! Can’t wait to see how it plays. Right there with you! The Curse of the Pierced Heart made me itch to make a Vamps deck that took advantage of bloodthirst alongside it. are these in stores yet? Or did you score some early ones haha. the intro pack deck lists were posted on magic’s website.